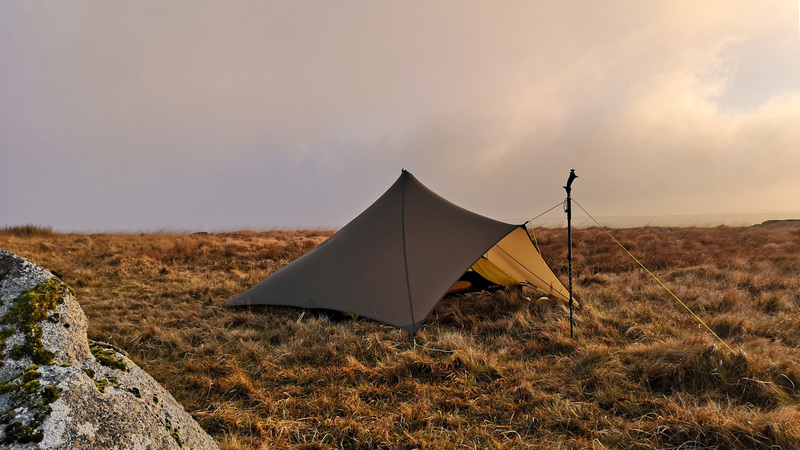 People in the UK often moan when the Met Office get things wrong… This is not a moan, its more of a laugh as the weather was so unexpected It’s gave our gear a great test and us confidence in it. It was a bit of a last minute plan but there was still enough time to check the weather and select gear, pack etc. The forecast was for poor visibility all day, clearing in the late afternoon/early evening with winds averaging 25mph, max 35mpg gusts….. I picked Jay (Red Paramo Alta) up in the morning and we met up with Karl (Dark Blue Paramo Bentu), at Postbridge on Dartmoor. From here we set off for a pretty short walk, more of a social catchup. The route was an easy one, even in poor visibility the chances of wandering off was slim, even so, we all had maps and compass as well as our phones. We followed a path/track out of Postbridge towards Broad Down, a few small river and bogs to cross and we were on top of the hill looking down towards the East Dart River. In good visibility, this is a beautiful landscape with a run of small waterfalls and sweeping hills either side. The East Dart runs through a well walked pass called Sandy Hole Pass, again in good visibility is very picturesque as your’ll see from pictures taken the following day. Shortly after Sandy Hole are the range posts marking the Okehampton and Merivale Ranges. The ranged are used by the MoD for live firing exercises and should not be entered of red flags or lights are visible. The MoD publishes the live fire schedule HERE. The MoD also use the areas for blank firing or navigation training so do not be alarmed if you see soldiers, alone of in groups. Our route basically took us to the Merivale/Okehampton range border, across Cut Hill Water and up towards Cut Hill. Due to the amount of bogs and peat on Dartmoor, between 1895 and 1905 a number of ‘Peat Passes’ were cut under the direction of Frank Phillpots. The cuttings are all marks with standing stones and a plaque. The cuttings make crossing some areas of the more easier and a great navigation aids. As we neared the top of Cut Hill, our destination came in to view….. nearly. Fur Tor, sometimes referred to as Queen of the Moors or Queen of Tors. Funnily enough, when we were on top of Fur Tor, the weather began to clear up and the views started to open up. Some people say that the best view on Dartmoor is from Lints Tor. I disagree with this, I think the best views on Dartmoor are from Fur Tor. Views across the West Okement Valley, towards the Tavy Cleave, Across the Merivale range and over to Hangingstone Hill. As the sun was beginning to set, we chose out pitch locations and setup camp for the night. At the time of pitching the winds were as forecast, ESE-ENE 25-35mph…. The Sigma was a very impressive tent all weekend. Pitched nice and taut, lots of space within, small pack size and pretty light. The wind started to pick up a little but nothing to worry us. I had used my Trailstar on many occasions in strong winds and knew it would be fine. Oookworks Weenest, inside my Trailstar. The gusts were averaging double what the mean wind speed was. This again did not overly worry me. I have used the Trailstar in winds up to 65mph without issue and with the forecast in my mind, I thought this would blow though and settle down……. We all settled down, unpacked the rest of our gear and put the kettle on for a brew. I took out my favourite setup, a Trail Designs Sidewinder Ti Cone, paired up with an Evernew 600ml pot. I was using Hexi for this trip so also had a foil base plate to protect the ground from the flames. I like this setup allot. For the meals I use for 3 seasons its plenty big enough, packs down nice and small, is very light and easy to use. I had taken enough food out for a few nights so ended up having a starter, main and pudding. The Lyo Cream of Tomato and Pepper Soup is lovely, thick and creamy and a great meal to instantly warm you up. This was followed by a Mountain Trails Mince Beef Dinner which I can only describe as a very yummy hot pot type meal. It comes in two packets, which its not great I know but I find they rehydrate super fast and use minimal water, in this case 320ml. I think the packet states 350ml but I find 320 is ample. Pudding was less of an excitement, a few Wispa bars and some Whisky, a Glenfiddich 12 year old this time.. It was after dinner that the wind really started to pound us. We had all gone outside and had a chat but found it hard to stand up in the wind, I took one final reading before climbing into my shelter and bedding down with a film. I could not hold the phone or Xplorer still outside so had to photograph inside the shelter. the mean wind speed was 69mph when I took this. 70+ mph was more than my Trailstar had ever seen, pitched at 135 its was dealing with the wind very well so I decided to leave it pitched high, knowing I could drop it if needed. We all agreed in the morning that the wind had got even stronger and we estimated a mean speed of around 70mph with gusts in excess of 85mph. I managed not only to watch Lord of the Rings, the Two Towers but a good five or so hours sleep too. At around 0400 I noticed a slight flap on the rear of the Trailstar so went out to take a look, I was blown off my feet and went flat on the ground. Not something I would normally admit to but the wind literally flattened me. When I got up, I found that the rear line had slipped to the slip knot I put in the lines just behind the lineloc, it had only slipped 2″ but in that wind it was enough to wake me. I tightened the line, put the slip knot closer to the linloc, had a coffee to warm up and then went back to sleep. The following morning was still windy but mainly clear with the wind around 30mph, much more like the forecast had advised. We all had breakfast, checked over our shelters, all of which were fine and had a chat before packing down and heading off. The walk back was uneventful and much more enjoyable with very good visibility allowing us to enjoy the views. I had been very impressed with the Trailstar. In that strength of wind, most people would have advised to lower it down but there was no need. Yes it was flapping a bit but any shelter subjected to winds like that would. It kept me out of the wind, dry and safe. I also used my MYOG Apex 133 quilt. Although the lowest temp we saw was 1C just after sunset the air temp rose to around 3C through the night and being inside the nest gave some thermal protection. I found the quilt very comfy, no cold spots and I didn’t wake up with a chill. Just before sunrise I felt the need for an extra layer on my torso which is always the case no matter what sleep system I am using. Other notable gear, my new Montane Fireball Verso. I have used this only a few times now but its a very nice top. Light, pretty wind proof, good dwr on the black face fabric and for me pretty warm. Both Karl and Jay filmed the walk. Once their videos are live I will update the post with links to them..